Considering the availability of farmland in Indonesia, and the forests across several of its islands, the country has the potential to provide abundant timber and rice to its population, and should have the resources to feed 2.4 billion people with minimum challenges. But the reality is different, which raises many important questions — like why, even with enough farmland, are communities living near forests still lacking enough food? According to Lesley Potter, who has carried out research on small-scale farmers in Indonesia since 1981, people living in rural areas previously found it easy to cultivate and harvest crops ­— such as rice which, as we know is a staple food in Indonesia — so they kept on planting more to achieve additional profits. But nowadays, they are facing the problem of their land, including forest areas, changing and being used for plantations. There are indications that the proportion of land being used for oil palms is set to increase, probably with serious implications not only for local livelihoods but also for food security and farmers’ self sufficiency. While attending the 2014 Forests Asia Summit on 5-6 May — which was organised by the Center for International Forestry Research (CIFOR) and co-hosted by Indonesia’s Ministry of Forestry — I was able to increase my knowledge and get new insights relating to forests and food. Some of my friends and I, representing the International Forestry Students Association (IFSA) Local Committees (LCs) from Bogor Agricultural University (IPB) and Lambung Mangkurat University (UNLAM) joined the youth session on the topic “Forest landscapes for food and biodiversity”. At the special session, we were able to talk with several summit participants from various nationalities, professions and backgrounds, which was one of the best opportunities to exchange our ideas. The ideas and findings were presented later in the summit outcomes. The discussion on food, led by Jan Joseph Dida during the Youth Session at the Summit, was a great way for youth to get involved in a conversation on global problems like climate change, and above all to discuss the best ways to secure the future of Southeast Asia. Looking back some decades ago, when there was no deforestation, when people had enough food to eat and the surplus food was sold for business, we had fertile land and abundant water resources. Now the picture is very different, and it may get worse if we don’t act now to save our forests for food security. If there are no forests, there will be no food and, of course, no life. It is high time for all of us to save this earth and its resources, so that it can feed our population and the future generations. Citra Delonix Regia is a student of silviculture at Bogor Agricultural University. 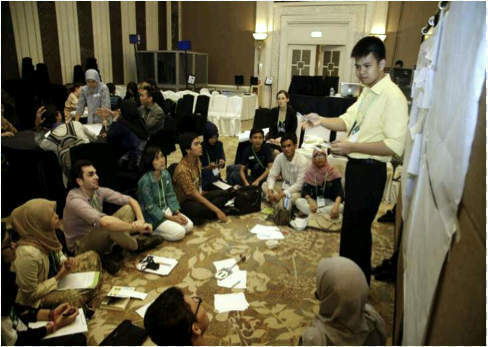 This blog post is from a social reporter at the Forests Asia Summit. Our social reporting channels are not vetted as official communications by CIFOR or the Summit partners. This post represents the opinion of the individual author.